"Pictorial" photography, the predominate style from the 1850s through the 1870s, fell into a "story-telling" tradition and made use of composite prints, costumed models, and painted backdrops. English photographers Oscar G. Reilander, Julia Margaret Cameron, and Henry Peach Robinson are associated with this style. In the 1880s, Henry Peach Robinson instigated a new direction in pictorial photography, railing against the false "artiness" that dominated photography of that era. He called for a more direct approach. He began focusing directly on the subject, letting the foreground and background be out of focus  an approach that he felt more nearly approximated the seeing of the human eye. Robinson's ideas influenced a new generation of photographers who began to think of photography as an art in its own right. These new "Pictorialists" believed in "art for art's sake" and created an international movement with juried exhibitions and salons at the Vienna Camera Club, the Linked Brotherhood in England, the Photo Club de Paris, and the American Photo-Secessionists galleries. The criterion for inclusion in these exhibits was a photograph judged to be of aesthetic and artistic merit. One of the most hotly debated aesthetic discussions of the day was, "Is photography art?" Many pictorialists felt that the artistic merit of a photograph increased proportionally to the degree it resembled a drawing, a mezzotint or a painting, and ideally, an Impressionist painting or a Japanese print. Creating mood and a sense of light through softly-focused images were primary concerns. 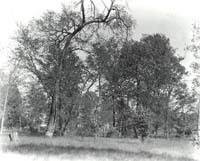 Often photographers manipulated and added additional "handiwork" to the image through printing techniques, such as gum-bichromate printing, in which the image was transferred onto a thick, soft, malleable coating. Most critics and photographers were delighted with the results. However, Henry Peach Robinson, the proponent of naturalistic photography and one of the founders of the movement said, "If pure photography is not good enough or "high" enough, by all means let him become an artist and leave us alone and not try and foist 'fakes' upon us." Disillusioned, he came to see photography as a "handmaiden" to other arts. In the United States, one man  Alfred Stieglitz  stood out as a standard bearer in the battle for recognition of photography as an art form. His importance is hard to over estimate. For more than sixty years, he encouraged avant-garde photographers by giving them places to exhibit. He influenced curators of major art institutions to grant photography a place with the other arts. He twice set the style for American photography. At his galleries, Little Gallery of the Photo-Secessionists (later known by its address "291") and An American Place, and in his influential periodical, Camera Work, he showed work of photographers Edward Steichen, Clarence H. White, Alvin Langdon Coburn, and Gertrude Kasebier, as well as work by visual artists such as John Marin, Joseph Stella, Max Weber, and his own wife, Georgia O'Keefe. He was the first in the United State to exhibit the work of Paul Cezanne, Henri Matisse, and Pablo Picasso. While Stieglitz championed pictorialist photography of the Impressionist ideal, his own work, except at the earliest stages, was different. It was cleaner, sharper, and more straight-forward and led to the next important movement  "straight" photography  a style that would dominate succeeding generations of "art" photographers, such as Paul Strand and Edward Weston. Frank Sadorus read photographic magazines, including Camera Work. He would have been aware of Steiglitz's Photo-Secessionists and the Pictorialists, and he, like them, considered himself an artist (he even called himself a pictorialist in an inscription on the back of one of his photographs). There was another strong influence on his work  snapshot photography and the Kodak Moment, brought to the world by George Eastman.